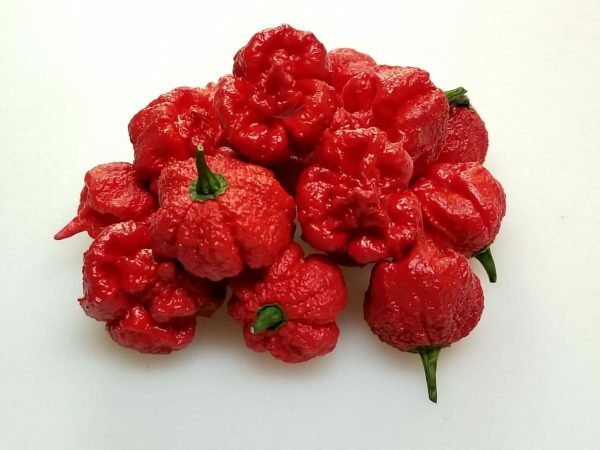 Hurt Berry-(Capsicum chinense)-The name comes from chileheads who tried this mean looking superhot cross while having a few pints in their favorite U.K. pub. One look at it and you won’t disagree with them. This cross comes from Master grower and Reptile lover Graham Lee Warburton. It started out as a Reaper X Jigsaw cross. 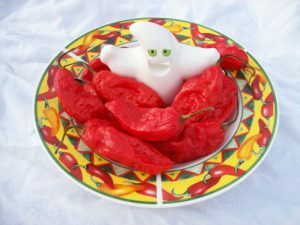 Later a Moruga UV was crossed into that and this became the Hurt Berry pepper. 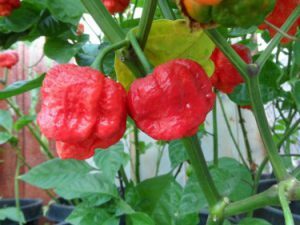 Graham has sent seeds the past few years to both American and U.K. growers to grow out. One of the more consistent variants came out of Wes Lanes grow and that is what I have here! As with any superhot cross thats young you may not get great consistency. But you will get Hurt by the Hurt Berry! 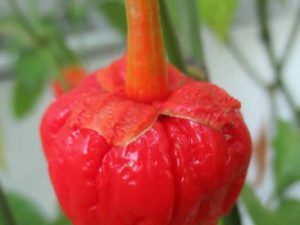 The Hurt Berry ripens from green to dark red and produces pods about an inch in diameter. They are extremely bumpy and spiky looking! If you can get past the heat they have fruity flavor tones. Another great thing about this strain is it produces faster than most other superhots for some reason. 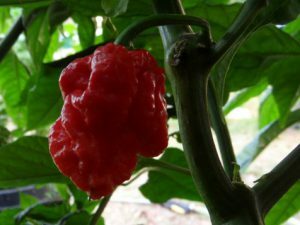 The Hurt Berry chile plants grow over 3 feet tall. They would be great for making a hot salsa, hot sauce or torturing your ex spouse that’s behind on child support payments!